As some of you may know, Susie Kang is a very active member of the CCIM (Certified Commercial Investment Member) Institute. It is a prestigious international organization that certifies commercial and investment real estate professionals. 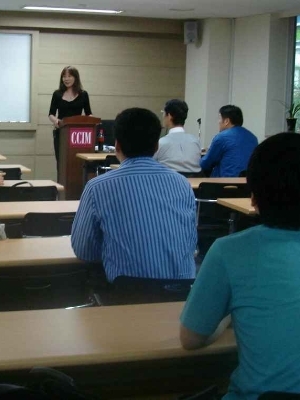 Recently, Susie flew to South Korea to not only take part in CCIM Institute activities, but to teach two workshops. The workshops included the Site To Do Business workshop and the How to Complete the Portfolio workshop for other CCIM members. In her down time, she was able to meet with her family and friends in the area. Susie’s commitment to volunteering her time with the CCIM institute also includes her work for the Designation Committee, of which she is a member of from 2008- 2010. It is not only business on her mind; after all, what's business without a community to enjoy it in!